Synergy Chiropractic was established in October of 2008. Drs. Aaron & Jamie chose the Wilder and Burlington locations to make it easy and accessible to patients traveling from anywhere within the Northern Kentucky region. At Synergy Chiropractic, relief or wellness care… it’s your choice. The philosophy that drives the practice and that has always been first and foremost is outstanding patient care. Drs. 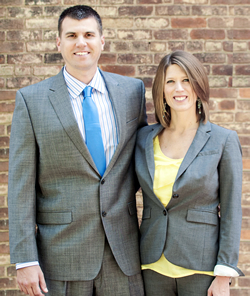 Aaron & Jamie truly want to make your experience at Synergy Chiropractic comfortable, educational, and rewarding. We see a wide variety of patients at our office. Some patients come to the office when they are at the end of their rope and want relief fast! Others come to the office not because they are in pain, but because they are interested in maintaining the health of their spine and want to prevent future injury. Chiropractic care is multifaceted in that it can work for both of these types of cases, but for OPTIMAL results, we want our patients to understand that what they are actually here for is the health of their nervous systems. Your nervous system controls every cell, tissue, muscle, gland and organ in your body and chiropractic gives your nervous system a favorable environment in which to flourish. The patient who understands this is going to reap the most benefits from chiropractic care. We live in a fast paced environment where convenience takes precedence over all else. When you make your choices for your health based on convenience, you will suffer in the long run. Does it take more time to cook a meal at home instead of going to a drive thru? Does it take more time to get up early to exercise and stretch? Does it take more time to unwind at the end of the day with a good book or quality time spent with family? Of course the answer is yes, but when you start investing your most precious asset of time into your health, you are making a conscious choice to again, not only survive, but to THRIVE! These everyday decisions will add LIFE to your years. So please, slow down and enjoy the journey!